November blues…and how to stay happy. I have to try my very best to like November. The month when we lose the very last of the golden days. It’s a blue month for me, no more Halloween, not quite Christmas and with daylight ‘saving’ it is just so bloody dark. November is also the month of Scorpio, and with me being a straight forward, fiery Leo, I am always a little uncomfortable around the dark, deep, brooding energy of November. So maybe that is why the month sits with me so awkwardly. Fire and water. Apart from pretending it is still October, I wanted to share some of the things I do in November to try not to let it get me down and to keep happy. Embracing the seasonal flora; I have recently started creating a seasonal wreath from the flowers and greenery in my garden. 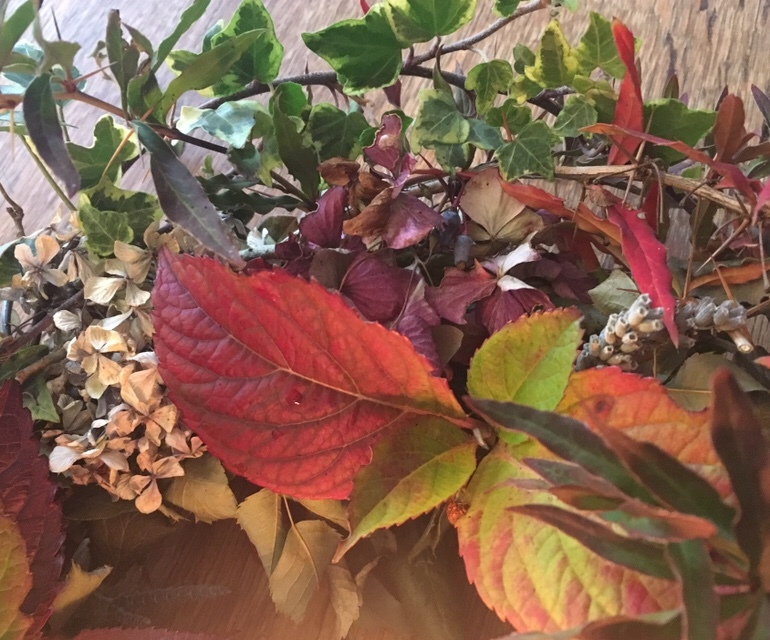 This month I have used the dried base from October and added fresh Ivy, Barberry and fresh Hydrangea leaves to give the November wreath a warm, dramatic feel. Ivy is evergreen, it reminds us to be steadfast, and feel our roots but keep growing. I have found this a good way to keep connected with the garden, and the seasons and to explore what is unique and magical about each one. It works equally well with arranging small vases, and even gathering pine cones and acorns. Lighting candles; The next best thing to having the sun, is having a roaring fire and lighting candles. Do this as often as is possible and don’t wait for special occasions. Read a good book; With no more gardening to be done, well, there is nothing left to do but read, before the madness of the festive season begins. One of my favorite recent seasonal reads is The Winternight Trilogy by Katherine Arden, the third book is due out January and I can’t wait. Fire and the Stars; We Brits have a thing called Bonfire Night, and we gather around bonfire and watch fireworks. My family enjoys sitting around the fire outside so much, we try to make it a regular occurrence over winter, and not just for Bonfire night. Make finger foods and go out and sit around the chiminea on a clear night and watch the stars. Grow something; My winter vegetables give me some solace in the darker months, they cheer me up and provide a lovely fresh pick me up to winter salads. It is amazing how many lettuces and leaves will grow quite happily in the coldest of winters. If you don’t have a lot of space them how about grow some garlic? You can plant it now right up until December and it will be ready to harvest next year. You can grow garlic in a pot if limited to space, just make sure you purchase it from a garden center or online, as the garlic you buy to eat from the supermarket is grown to eat and not to grow! I like this purple variety. Animals; I don’t know what I would do in winter without my pets. That time each day outside cleaning and feeding the ducks keeps me connected with my garden and the outside space, and as a home worker most of the time, I can become a hermit if left to my own devices! I also think a cat curled up on your lap is just about the cosiest thing you can get, that and hot chocolate! What do you do to keep the darkness at bay in November? Though remember that Samhain is just the begining of the Winter Months. The dead remain walking around until Imbolc in Febuary. That’s why the English read Ghost stories to each other in Christmas. Not even counting the Wild Men Shamans during December plus the various Krampus walks. I do the last little little things in my garden and tuck it all in for winter.